Considerable research effort has been devoted to questions such as how birds sing and why birds have such elaborate songs. Most research questions involving bird song are classification, comparison and quantification of sounds in the song within and among individuals. Typical questions include how song repertoire size or song variability influence mate choice and male-male competition. 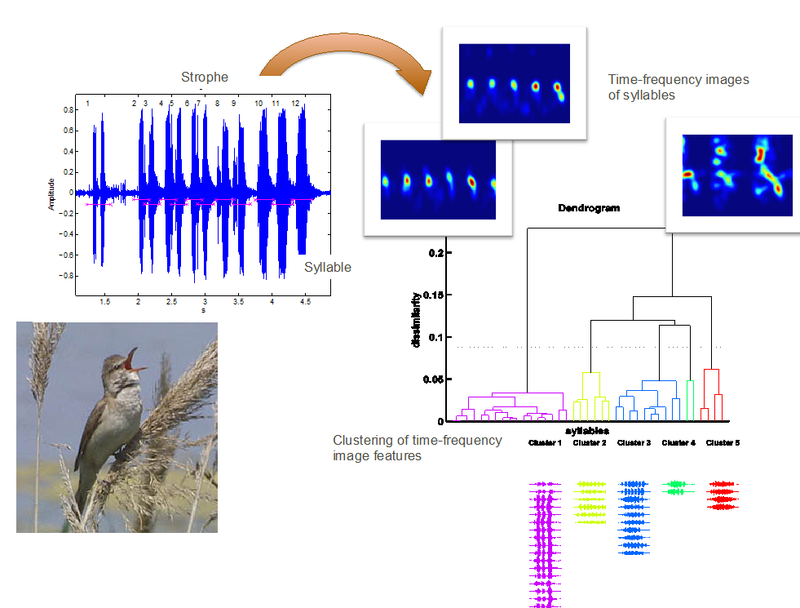 In this project we aim for an automated method of syllable detection and classification in bird song. The method provides a tool for pairwise comparison of syllables with the aim of grouping them in terms of their similarity. This allows analyses such as (i) determining repertoire size within an individual, (ii) comparing song similarity between individuals within as well as between populations of a species, and (iii) comparing songs of different species (e.g., for species recognition). The algorithm, which allows an unbiased, reproducible and reliable song analysis, is a three-step procedure, comprising syllable detection, representation and comparison (with further clustering, if required). The novelties in our approach are the usage of the ambiguity spectrum (a transformation of the spectrogram and also called the Doppler-lag spectrum) for feature extraction and a novel similarity measure for subsequent syllable comparison. The advantage of the ambiguity spectrum as opposed to the popular standard spectrogram is its invariance to time and frequency shifts of syllables. M. Hansson-Sandsten, ”Classification of Bird Song Syllables using Singular Vectors of the Multitaper Spectrogram”, EUSIPCO, 2015.